Dan Adams first came on my radar a couple years ago via Adam Hood. Adams was a fellow southeastern expat frustratingly plying his songwriting trade in Nashville. Through meeting several folks involved in the scene down here, the Georgia native soon realized his music fit more in the Americana/Texas mold than that of the trucks and tailgates Music Row rage. A few acoustic touring runs, some successful networking and a full stakes-pulling move of he and his family to Austin has provided the background for a wholly satisfying new album entitled Live Oaks and Lights. Adams began piecing this record together prior to his Texas move, but the pieces came together once he was within Lone Star borders. Much like his kindred spirit Hood, Adams’ version of country music is permeated by soul, blues and groove. While not as gifted a vocalist as Hood, Adams proves himself equally adept at delivering self-penned emotions that connect with his audience. 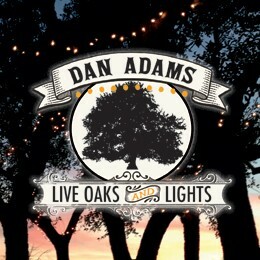 Live Oaks and Lights is a formidable collection of songs and features a robust group of co-writers. Ben Danaher shares credit on “Straight Whiskey and Bent Strings”, a honky-tonk musical journey in song form. Brian Burke joins Hood and Adams to deliver “I Won’t Do The Right One Wrong”, a simmering love proclamation that is actually reminiscent of some of the stuff on John Mayer’s Born and Raised record. And Blake Myers of Rosehill shows up as a co-writer on “A Little More Yesterday”. “Bring Enough Gun” showcases Adams’ rock side and has echoes of the great Warren Haynes both in sound and style. All of those tracks are good, but perhaps the standout track of the bunch features the newly minted Mrs. Jason Eady, Courtney Patton on a duet called ” This Is How It Ends”. The track was recorded in a tiny office behind the bar at Luckenbach after a Sunday afternoon guitar pull. You’re so interesting! I don’t think I’ve truly read through anything like that before. Seriously.. thanks for starting this up. This web site is something that is required on the web, someone with a little originality! check out my website too and let me know what you think.